Frog Design’s Robert Fabricant on how social networks can be fun and good for you at the same time — and Temptd, a new service created by Frog. It’s easy to forget the commitments you shared with family and friends in the fading hours of 2010. That’s the trick with New Year’s resolutions: They rarely stick for very long. We can often chalk these failures up to faults in our hard-wiring; as scientists have shown, our best intentions rarely rule the day. But over the last 12 months I’ve been interested in looking at how social networks might tip the balance in your favor. Social networks reached critical mass in the U.S. in 2010, in large part because of the ease with which they can be accessed on most smartphones. People use their spare time to keep tabs on their social circle, which often spans many different networks at once. Can all of this activity be harnessed for some form of social good? There have been countless experiments using Facebook, Twitter and other platforms for behavior change in personal health and finance, many targeting teens and tweens (given the staggering amount of time they spend on these networks). Will social good become a new form of currency on social networks? Skeptics wonder if all of the pleasure of updating your status will somehow be weighed down by these “good intentions.” Is it possible for social networks to be fun and good for you at the same time? 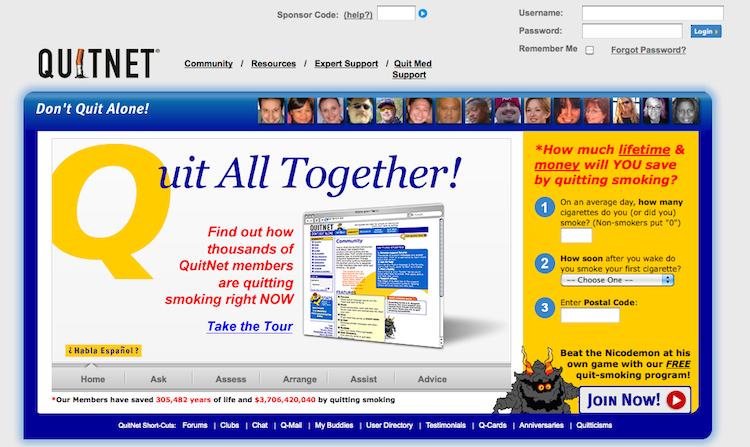 Social networks are rampant with smoking support groups. This question first came into focus for me two years ago at SXSW. I was hanging out with Dennis Crowley and crew at the launch of Foursquare. I was very curious to see if adding simple rewards to spontaneous social planning would “kill” the fun. Social networks play a huge role in how and where people hang out. This is established behavior that services like Foursquare are looking to harness (I have personally observed the use of online social networks to plan meetups in places as unlikely as the townships of Soweto). But that doesn’t mean people will accept a third party tracking that behavior for meaningless array of points and badges. But it seems to work, at least for certain demographics (primarily young people). So, what if we could create a similar check-in and reward system (i.e. a game) to amplify other kinds of messaging — particularly health support messaging? Social networks are rampant with support groups in areas like weight-loss and smoking. This is also an established behavior, not something that needs to be invented. So, “where is the Foursquare for health?” as digital health expert Cindy Throop put it recently? This is not an idle question: the entire health and wellness industry has been chasing this dream for years. I can’t tell you how many meetings I have had with healthcare executives on this topic. In each case they assure me that they know exactly what to “tell” people to improve their health — but the problem is that no one is listening! In the meantime chronic issues like diabetes are ballooning among young people. Engagement with health support programs in areas like weight loss are abysmal — even when “consumers” are given real financial rewards for sticking with the program. So what would a “Foursquare for health” look like and how could it help you this year? The most important thing is to build on existing behavior. Online forums related to weight loss and other health issues have been around for more than a decade. There is a lot to learn by studying communities like the smoking cessation program QuitNet (750,000 members) and the dieting group SparkPeople (3 million members). Many of these communities have developed systems of recognition and reward, some planned (like Sparkpoints) and others improvised — like a “cybertrout” on Quitnet when a member has reached the end of “hell week,” also known as the first week without smoking. These simple forms of messaging can serve many social functions in building and sustaining an active community. You must take care of newbies, who are trying to make a change, as well as the small number of very active users that provide much of the encouragement and advice. One of the interesting qualities of most social networks is that they have a short memory — there is no master archive or knowledge-base. If you observe a social support group on Facebook over time you will see that the same questions get asked over and over again, providing an important opportunity for key members to restate the same advice, reaffirming the core values of the community for newer members. It is important to encourage all forms of engagement, even if people are failing to meet their goals. Part of the challenge of behavior change is that the benefits are often far removed from the pain. We don’t get any immediate reward for skipping Dunkin Donuts on the way to work. Those benefits have to wait for our cholesterol count. This is where game dynamics can play a critical role. Social competition and reciprocity are powerful rewards. And social networks can deliver those rewards immediately, and in real time. To be effective, games require a larger narrative (not just best intentions). Some kind of overarching metaphor or story that elevates the messaging and other activity and gives them additional meaning. This is the hardest thing for the healthcare community to get. When the App Store launched it was immediately clogged with calorie trackers and daily health tip generators from heavyweights like GE and the Cleveland Clinic. Yet engagement was remarkably low. According to one study, health apps represent 43% of the downloads among iPhone moms and yet do not rank in the top 10 in usage. Part of the challenge is that these apps are always the expert, telling users what they should be doing each day or week to achieve their goals. This is not a good basis for building trust and engagement. Too often the user feels like they are letting their “digital coach” down. It doesn’t take them long to tune out. In 2010 I found myself back at SXSW, this time with Jason Rzepka, the head of Corporate Affairs at MTV Networks. Jason pioneered the first pro-social use of Foursquare with GYT (Get Yourself Tested), an MTV program to encourage kids to test for STDs. This summer they launched a badge tied to sexual health clinics around the country, so that young people could check in on Foursquare and receive special recognition for getting tested. Could we create a check-in and reward system for weight loss? With Temptd, users can get immediate feedback and support through a Facebook app.Jason shares my interest in social networks and behavior change. So we decided to partner on the launch of a social platform around health timed with a new documentary series I Used to be Fat. The premise of I Used to be Fat is simple: MTV picked twelve overweight teens and gave them one chance (the summer after high school) to get in shape before arriving in college. MTV provided them with full time trainers and documented their journeys before and after they arrived at college. The kids lost as much as 90 pounds in three months as they grappled with a host of emotional and physical challenges and reinvented themselves. Their stories are incredible. Jason was looking for a way to extend viewer engagement with the topics of the show and give kids a way to meaningfully connect on the topic of health and weight loss. To share their challenges and reward each other for their support. 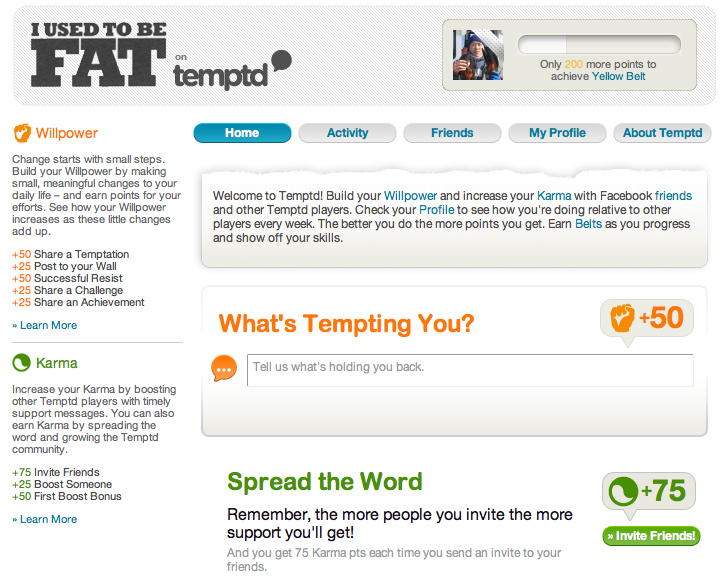 At frog, we have been working on a concept for a social support platform called Temptd. With Temptd, users can get immediate feedback and support through a Facebook app (and soon to be-launched iPhone app). Participants can interact with each other, earning Karma and Willpower points for different types of healthy behavior. The app incorporates a martial arts metaphor, using different color “belts” to measure progress. Temptd went live on Facebook on December 29 with the launch of the show — just in time for the New Year. All of the kids and trainers from the show will be active participants on Temptd, enhancing the game. As we kick off 2011 we hope that Temptd will offer a unique opportunity to see how gaming and social networks can work together to make our resolutions stick in 2011.